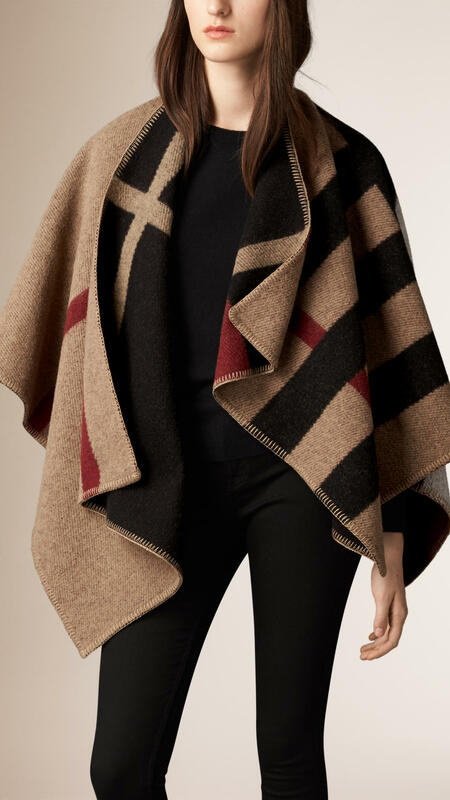 Autumn is here and Winter isn’t too far around the corner, so what better way to keep warm than with a gorgeous Burberry cape or poncho? The best thing about these knitted beauties is the simple fact that they are great transitional pieces for those days that it’s not quite cold enough for a full coat, but it’s not warm enough for just a sweater either. 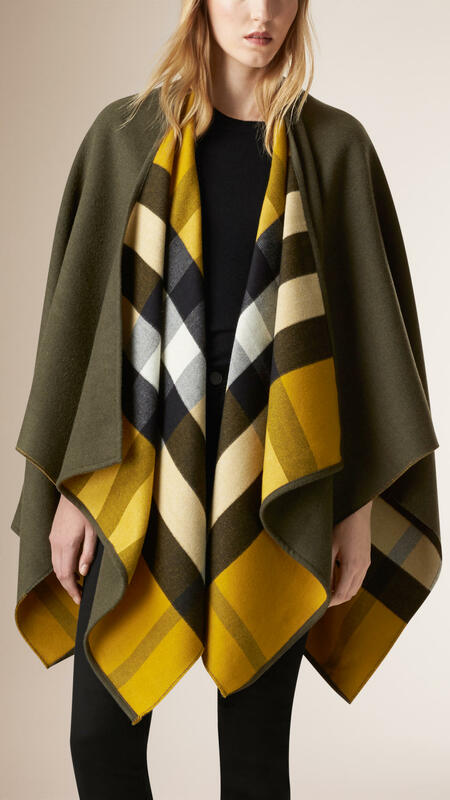 Burberry have some of the best capes and ponchos on the market and are known for their craftsmanship, so you can’t go wrong with one of their gorgeous capes draped over you to catch the eye of passers by. You may remember the past couple of seasons running in their AW14 and AW15 runway shows that they showcased some gorgeous, tribal printed capes which were monogrammed with the models initials. Well, that doesn’t stop there! You can have your Burberry monogrammed too if you want to and join the string of celebrities, fashion bloggers and models who have theirs personalised. 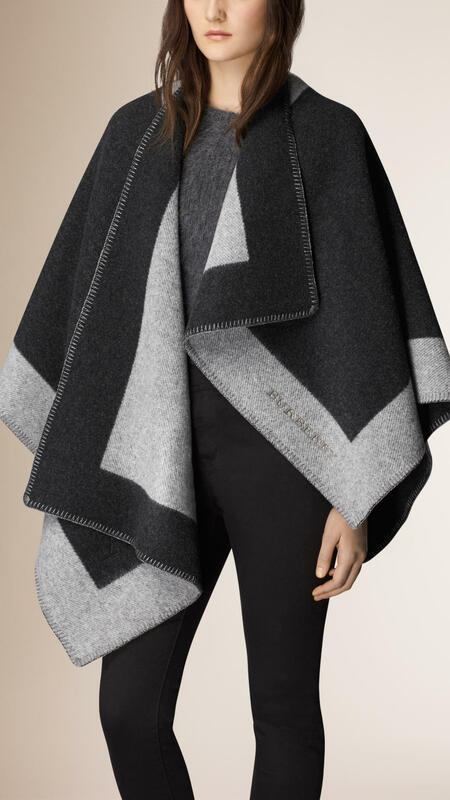 I’ve chosen 10 of the best Burberry capes and ponchos here that I think will only add elegance to your Winter wardrobe in ways that other pieces just can’t. 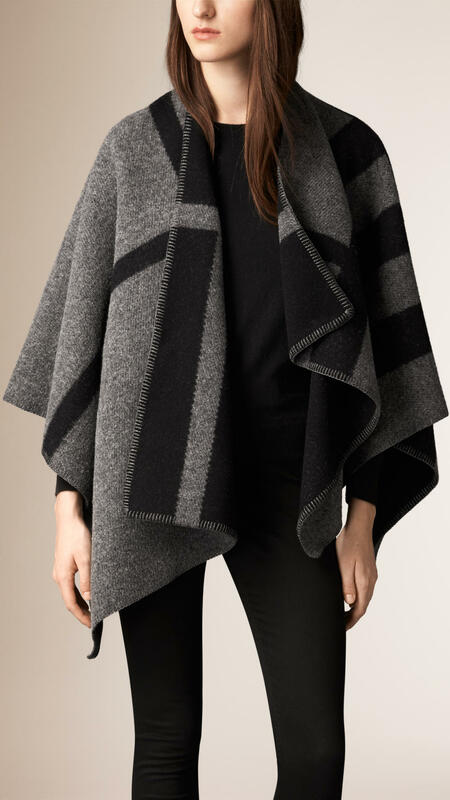 There’s colour, neutrals, prints and more, so there’s a cape for everyone. 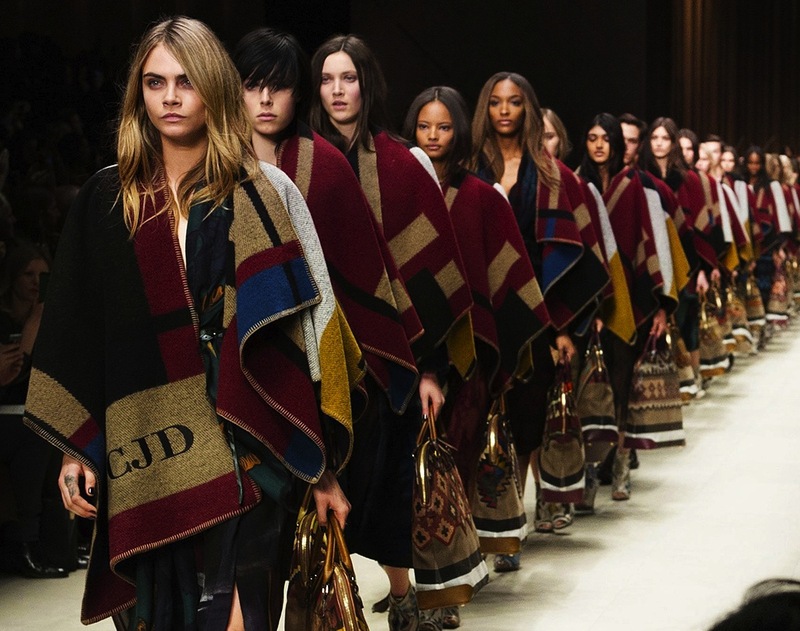 Which Burberry cape is your favourite? This is a subtle take on the iconic and classic Burberry cape, coming in their pale camel colour which will go with everything. 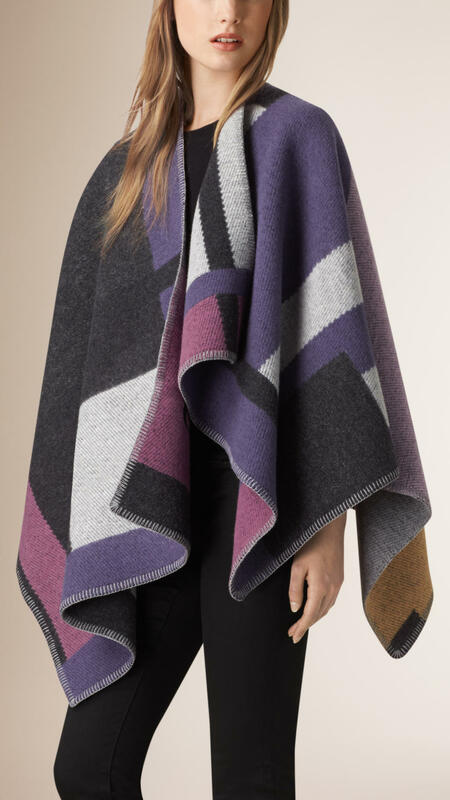 It’s called a blanket poncho and it will look amazing layered over some skinny jeans and boots. It’s a look that will ooze sophistication and style. Fancy something a little more known to Burberry and visually iconic? Why not try this wool poncho in their House Check tartan? Everyone knows Burberry for their black, red and camel print, so what better way to make a statement for the brand than with this one? If you want to liven things up a little and have a more standout piece, why not try this cape in Regency Purple? 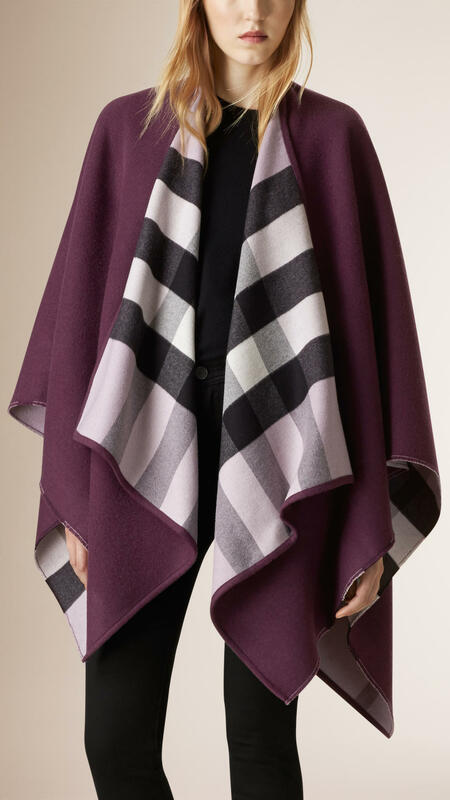 It’s got the subtle Burberry check on the lining, but it features various shades of purple all over, so it will definitely brighten up a Winter day. 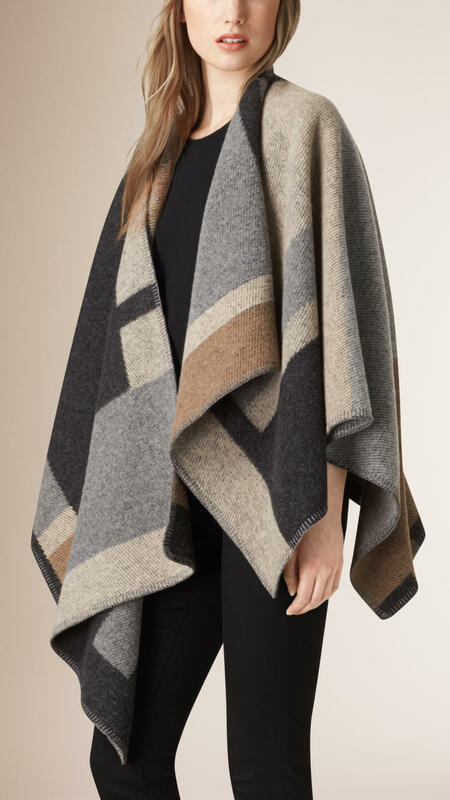 If colour isn’t your thing, why not try this poncho in a Mid Grey Melange? It’s a blanket style with light grey trim and the Burberry logo embroidered on the side, but it will be great for those days where you want to keep things toned down and classic. 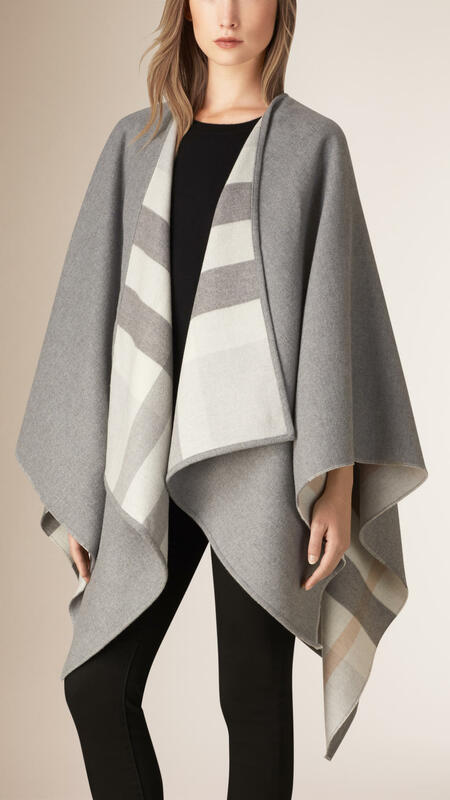 The chunky woolen capes might not be your ideal, so why not try this wool wrap in Light Grey Check? Not only does it have a cheaper price tag, but it’s more flexible and can also be worn as a scarf. Not to mention the colour and subtly is gorgeous. Maybe you have seen a lot of animal print on another fashion blog and want to try some of your own? 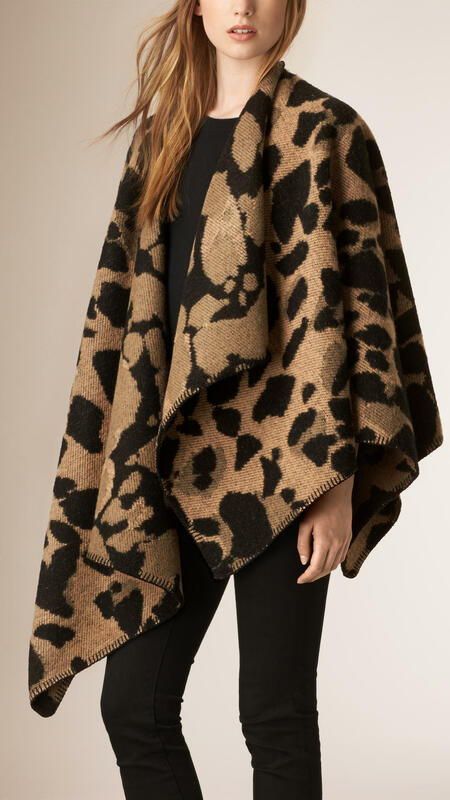 If you have a more daring personal style, why not try this animal pattern leopard print cape in Camel? It will really make a bold statement and stand out. Again, if you want something darker and not coloured, this Dark Grey Check blanket poncho could be an option for you. It’s a little darker in colour than the other one, but it will look perfect with black jeans and boots. 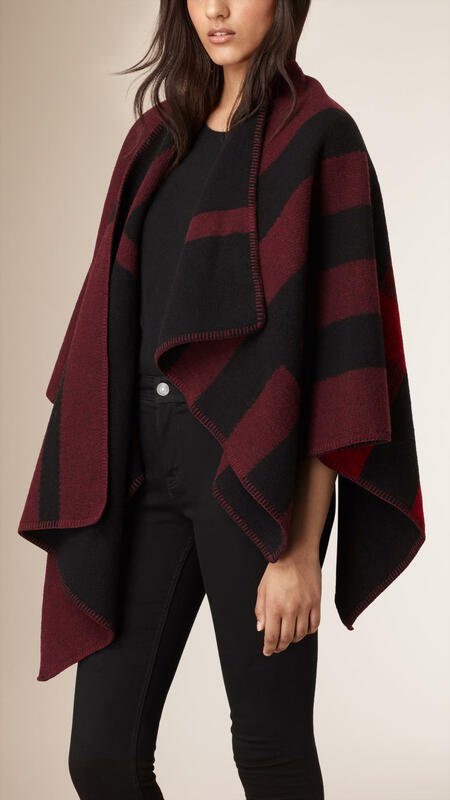 Burgundy tones are everything in the Autumn as they add a nice rich hue to your ensembles, so why not try out this Burberry poncho in Oxblood? It’s mixed with black to created the iconic check effect, but the burgundy tone is strong enough to really stand out. I definitely love this one! Maybe none of these Burberry capes and ponchos are striking enough for you and you really want something bold, bright and colourful? I recommend this wool wrap in Olive Green as it mixes a blend of pineapple yellow with shades of green. The colour scheme is great for Autumn and it’s not too outlandish. Finally, you might have liked the purple cape featured earlier, but it wasn’t light enough for your personal preference? In which case, this wool and cashmere poncho in Mauve Pink would be ideal. It blends a mix of pastel tones in pink, purple and grey with a hint of camel, which works harmoniously. Happy shopping!